Home » My Retirement Kitchen	» The Retirement Kitchen: Inflation Will Melt Away Your Retirement Savings like Ice Cream on a Summer Day! Ice cream will cost over $12 per half-gallon during your retirement. Understanding inflation is key to your retirement plan. There were ice cream cones on hot summer days. Always ice cream at my summer birthday parties. One of my favorite birthday ice cream treats was during high school. We lived in Corning, a small town in upstate New York, made famous by Corning, Inc., the glass company that makes Pyrex and Corelle, etc. In the quaint downtown was a wonderful, old-fashioned ice cream parlor called The Ice Cream Works. They treated you to a free ice cream sundae on your birthday. I remember that mine was vanilla ice cream with the most delicious raspberry sauce, whipped cream and a cherry. Another favorite birthday treat was an ice cream cake from Carvel. Even now, my birthday cake is a Carvel cake with those special chocolate “crunchies” in the middle. Here in New England there is a popular ice cream that is served at kids’ birthday parties, called Hoodsie Cups. Each child gets his own cup with a wooden paddle spoon. Over the years, my girls lost interest in Hoodsies and moved up to specialty ice creams like green tea, cookie dough, and anything with peanut butter cups. My husband has stayed true to his favorite: coffee. Like all good moms, I buy a variety of ice cream flavors so that everyone has something they like.It was time to stock up on a few flavors on a recent trip to the grocery store. I happened to notice how expensive ice cream has become. At $4.99 for a half- gallon for some and $6.49 for a half-gallon of others, I was surprised. Walking further down the frozen food aisle, I was more surprised to see that the little 14-ounce specialty ice creams were $4.99. Really? For less than a pint? Have ice cream prices gone up recently or have I just not been paying enough attention? Since it is National Ice Cream month, I decided to check out the situation and turned to my trusty favorite resource for price of goods data – the Bureau of Labor Statistics (BLS). Thinking it might be silly, but worth a try, I typed “historic price of ice cream” into the BLS search bar. Lo and behold, several articles and links appeared immediately. There was a listing specifically for the price of “Ice cream, prepackaged, bulk, regular, per 1/2 gal. (1.9 lit)”. The average price of ice cream across all US cities was $4.91 as of May 2014 (the most current month available). If you happen to live in the mid-west, the price was a little less at $4.57. (Maybe because the cows are much closer to the ice cream makers!) It looks like my grocery store’s price is right on the average. It still seems expensive, so I dug a little further back to see when the price of ice cream reached about $5.00. The BLS has ice cream data back to 1980. For us lagging edge Boomers, we were only in our late teens or early 20s back in 1980. Leading edge boomers weren’t even 40 yet. This table gives you a quick trip down memory lane of the average cost of ice cream over the past 30 years. Overall, the price of ice cream has increased some 173% over the past 34 years. This falls in line with the overall cumulative inflation of 188% over the same period. But, doesn’t this seem rather incredulous that we are spending over $3 more for the same half-gallon of ice cream that we were buying in the 1980’s? That’s what inflation will do to your favorite summer treat. Maybe more interesting is the price of an ice cream cone. Have you been to your favorite ice cream spot yet this summer? A small cone, one scoop, is somewhere around $4.50. Yes, that’s about the same price as a half-gallon at the grocery store. The leading-edge boomers will probably remember when ice cream cones were five cents. Their first ice cream cones in the early 1950’s were about a nickel. Ten cents for two scoops. What a shock to pay $4.50 for a small cone and $6.00 for two scoops today! A Woolworth’s menu from the late 1950’s gave customers a lot for 25 cents: a regular banana split, a tulip-glass sundae or malted milk. At Farrell’s Ice Cream Parlour in Portland, Oregon, banana splits were 75 cents in 1963 and didn’t reach $2.00 until 1979. More than 1.5 BILLION gallons of ice cream were produced in the US in 2011. You can’t beat an ice cold coke float or chocolate milk shake on a hot summer night. But, the cost of even a small ice cream cone seems to be pretty steep. So, I decided to head into my retirement kitchen and get back to basics: making homemade ice cream. I wanted to see if it would be more cost effective, plus it is definitely more fun than grocery shopping. 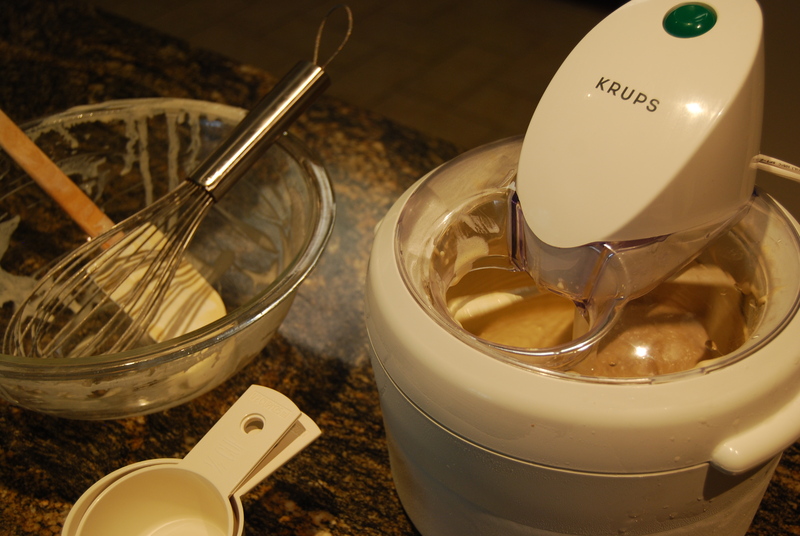 I dusted off my ice cream maker and made a batch of coffee ice cream in honor of National Ice Cream Month. 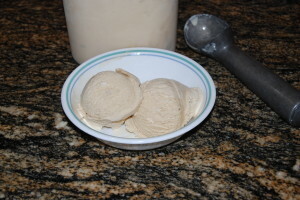 The ice cream maker didn’t require any salt or hand churning, so it wasn’t hard to make. Buying the few ingredients needed told me all I needed to understand why ice cream, and particularly premium ice creams, had become so expensive: heavy cream was $3.69 and light cream, on sale, was $2.99. The extra-large eggs were also $2.99. It was definitely not cheaper to make my own ice cream, but it did taste much better than store-bought. Making homemade coffee ice cream on National Ice Cream Day. It was delicious! Over time, inflation wreaks havoc on even low priced items. Those of us who run the family budget and do the grocery shopping start to notice price increases and inflation first at the grocery store. In fact, food just had its highest price increase since 2011. Once we get to retirement, the cost of food will continue to rise, but we won’t have a paycheck that keeps pace with inflation, unless we create it from our assets. That means our savings will have to continue to grow above the rate of inflation so that we can take more out each year to buy the goods we will need. Set up an overall retirement spending plan – see how much you are likely to need to buy groceries, ice cream and everything else once you are living in retirement. Put some of your savings in a portfolio designed to give you positive returns after inflation; and, plan to set aside enough of your savings in cash so you are protected from market ups and downs for a year or two. If investing is not your area of expertise, find a retirement income financial advisor who can help you balance all of the market factors and account for inflation. Your goal: a retirement paycheck that increases each year to adjust for inflation throughout retirement. Here’s to looking forward to the next 30 years of National Ice Cream Month. Just plan for your half-gallon of ice cream to cost about $7.00 in 2024, $9.00 in 2034, and $12.00 in thirty years. Looks like the days of the 5 cent cones are long gone. The Ice Cream Works in Corning has become the Old World Café. Drop by if you’re traveling through Corning!